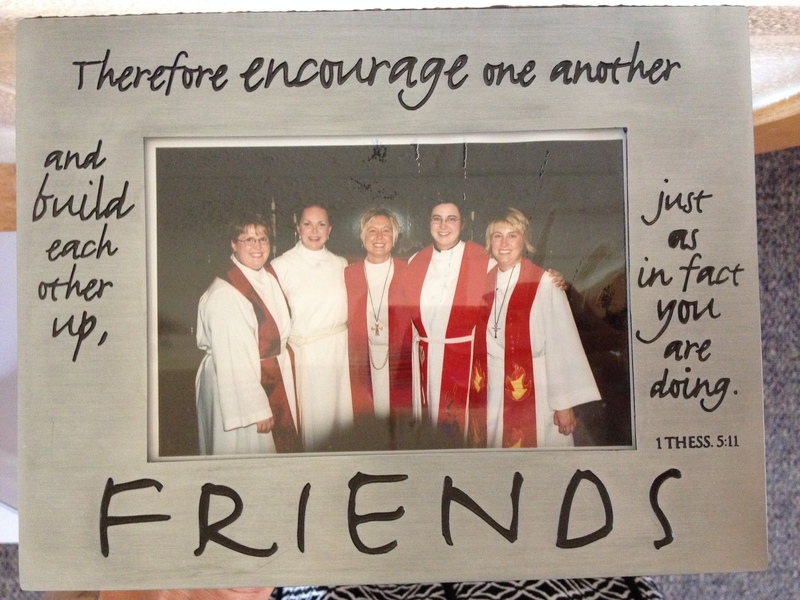 I never got around to framing the photos from my ordination. I had grand intentions of making enlargements of the photos of me with my home pastor, the laying on of hands, and the huge group of pastors who were present. But life got busy after that exciting day and there never seemed to be time for making a fuss over pictures. Except for one. I found this frame and knew instantly that I would use it to display this photo of my friends. These are the women who encouraged me through the low points of seminary and who built me up to believe that I was gifted and called into ministry. They are all still my friends though we’re scattered across the country, and we continue to encourage each other across the miles. Because that has made all the difference. Encouraging each other takes actually very little effort. When you ask people what helped them through a tough time, it’s usually not that a friend took over the running of their household and raising of their kids for a month so that they could sort out the challenge (although I’ve heard of that actually happening.) It’s usually just that someone called to see how they were doing, or that someone invited them to lunch, or that someone listened long enough to hear the whole story. Encouragement is simple and profound. It gets us through the day. And for those of us who ask WWJD? (what would Jesus do?) it’s one of the first answers. Jesus was in the hope business, and encouragement was his specialty. And his disciple Paul, it turns out, gave instructions to new congregations of Christians that always included the admonition to encourage one another, like the verse on my picture frame. They live on the ranch across the street from my neighborhood, and I see them from a distance most every day. They graze from pasture to pasture and usually aren’t very interested in the humans going about their lives on the other side of the road. 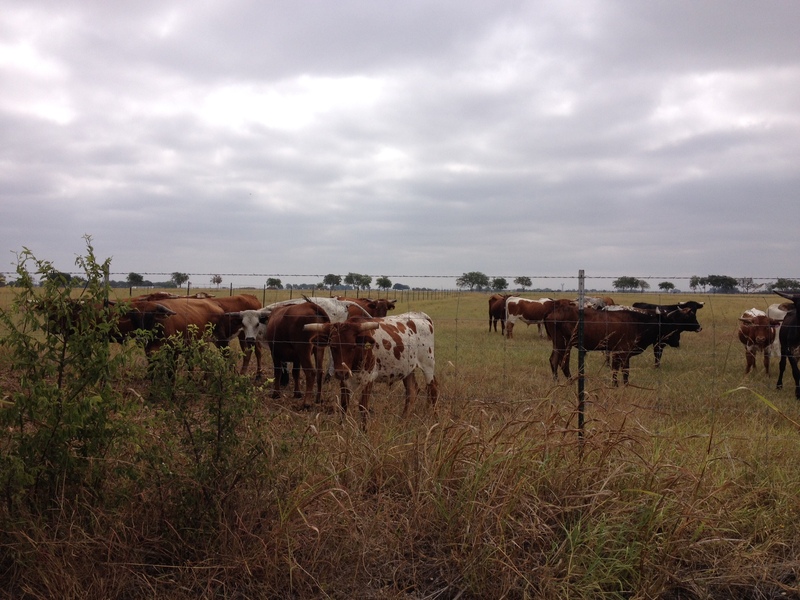 But on this day, they were congregating around the fence, and seemingly very concerned with my day. Their heads all turned toward me as I walked past, and they rearranged themselves to face me. I got a couple of “moos” as well, which just added to the experience. If you grew up around cows, this may mean nothing to you. But I needed encouragement that day, and these cows were it. They were there to send me off in my frustration and were there waiting for me to return transformed. No words were exchanged, no grand gestures were made. But only the gift of presence, and the reminder that I am part of a grander scheme of creation and connected with life in so many forms around me. My girlfriends weren’t there to encourage me, but God’s creatures were. And as I ran, I remembered that encouragement is all around, in the life force surging through nature, in the faces of friends and neighbors, in the very act of breathing and moving and growing stronger. The Spirit is our encourager, ever present, ever hopeful, ever bringing life. If you need encouragement today, let this be it: that the God who created heaven and earth also created you, and has promised to be with you through the power of the Holy Spirit. Thanks be to God.